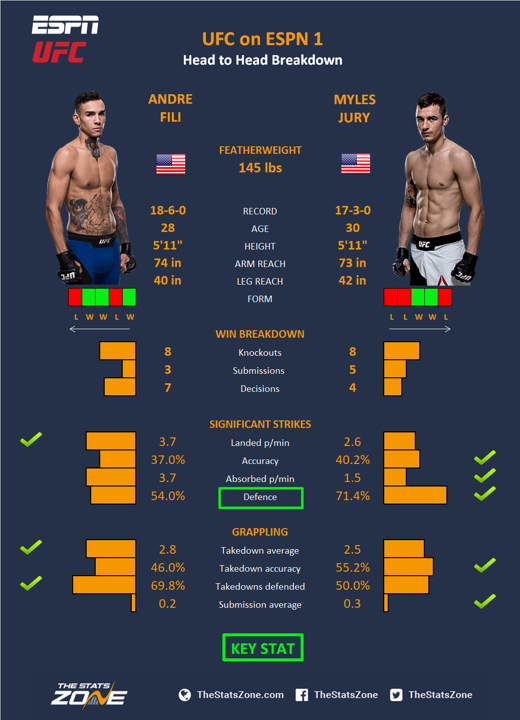 Andre Fili and Myles Jury kick off the main card for UFC on ESPN 1 with both featherweights looking to bounce back from a loss. Fili is another talented fighter who has struggled to string a set of wins together in the UFC. He was 13-1 after his UFC debut but the price you pay for fighting under the leading promotion is that you are competing with the best fighters in the world. He won two fights in a row for the first time in the UFC but lost a close decision in his last fight against Michael Johnson. Jury has also felt the wrath of the top flight after arriving in the UFC unbeaten and winning his first six fights to rise to an impressive 15-0, but this inevitably led him to killers such as Donald Cerrone, Charles Oliveira and Chad Mendes. Both fighters have all the skills but due to the pressure of needing a win, they may be cagey and hesitant to throw their usual expressive strikes. They fight best best when they are constantly moving and offloading combinations and they need to remember the form that got them to the UFC. The stats suggest they are evenly-matched but the difference is likely to come down to Jury’s exceptional striking defence. If he can neutralise the stand-up threat of Fili and stifle his rhythm, he can offload his own powerful strikes and mix in takedowns to take the fight away from Fili. Jury is also fighting in his home town and will have the fan support to help him earn the win.